Depending on the recipes they can contain concentrated musts, but thickeners are often added such as starch (modified or native), glucose syrup or fructose, pectin, Guar gum, xanthan, seeds of Carob etc. The balsamic dressing is a product recently introduced on the market, also called “balsamic sauce” or “balsamic cream”. Generally, a balsamic dressing can be done and aged in the traditional manner of the provinces of Modena and Reggio Emilia, but outside the supervision of conservation of the consortia and certification procedures; it can be also made up of products according to the disciplines of PDO and PGI, but not certified as products outside the provinces of Modena and Reggio Emilia. For condiments there is not a particular official standard, no recognition mark or name regulation, so the quality of the product can not be easily figure out by the label itself. For this reason, the intrinsic qualitative characteristics can be very different from one another, which is why they fall under this group of premium products as high quality condiments. 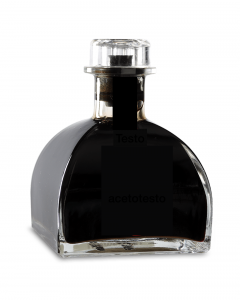 It is obvious that the balsamic dressing differs from the PDO and PGI: the former is the traditional one, produced with grape musts coming exclusively from the provinces of Modena and Reggio Emilia, fermented, acetated and subsequently aged for at least twelve years. The latter is obtained from a process of grated must, concentrated must, wine vinegar, with a process that is much faster than original traditional balsamic vinegar, and is therefore available on a lower price. Minimum two-month aging is required, not necessarily in wooden barrels, rising to three years for “aged”. Previous The balsamic vinegar recipe: With only one ingredient!